10 year old Nathan is just an ordinary 4th grade boy, with a hugely extraordinary imagination! 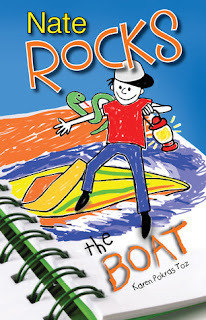 In book 2 of Nate Rocks, Nathan is headed to overnight summer camp. Dad is having to teach at a school for the summer and Mom has to keep an eye on Grandma so Nathan and sister Abby get to spend their summer in the great outdoors. Nathan doesn't think too highly of this idea until his alter ego, Nate Rock kicks it into high gear. As Nathan doodles, Nate Rocks transforms things around him to solve the toughest problems people find. All in Nathan's mind of course, but for us reading the book, adding fantastic tales to the already busy summer! Nate Rock pops up in the story at various times as Nathan wonders why he is called to help solve the problems and asks "Why me?" Each time the answer is "Why because you are Nate Rocks of course!" Summer Camp full of kickball, hiking, canoeing, ghost stories, new friends, sport, scavenger hunts, crafts, theater and more seems like it would be a fun read with just those elements. Add in Nate Rocks and his creative mind and the book is even more hilarious! Fantastic read for Elementary students who struggle to find 'interesting', 'funny' books. 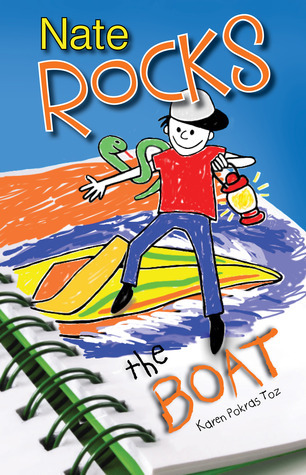 By using Nathan's imaginary counter part Nate Rocks, the reader is taken on adventures that ordinary 10 year olds aren't involved in. Quick paced and easy to read I think that this book will definitely Rock your Readers boat!